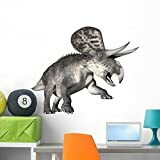 Zuniceratops was a herbivore (plant-eater) that lived in North America during the late Cretaceous period, between about 93 and 89 million years ago. It is the earliest known Ceratopsian dinosaur with eyebrow horns, as being the earliest known Ceratopsians from North America. Zuniceratops was discovered in 1996 by the son of Douglas G. Wolfe, Christopher James Wolfe, who at the time was just 8 years old. These fossils were found in the Moreno Hill Formation in New Mexico, USA. North American Dinosaurs - Zuniceratops lived in North America. Zuniceratops was a genus of dinosaur. "Zuniceratops" means "Zuni horned face" - "Zuni" refers to a native American tribe that live nearby to where this dinosaur was first discovered. Zuniceratops was a member of the Ornithischia ("bird-hipped") order of dinosaurs. What this means, is that although Zuniceratops was not closely related to birds, it did have similarly shaped pelvic bones. Zuniceratops was a Ceratopsian - a member of a group of related herbivorous (plant-eating) dinosaurs with beaks, many of which had neck frills and horns as well. Zuniceratops lived between about 93 million years ago and 89 million years ago, during the late Cretaceous period. 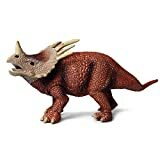 Zuniceratops was a herbivore (plant-eater). Zuniceratops was about 10 to 11 feet (3 to 3.4 meters) long. Zuniceratops weighed about 220 to 330 pounds (100 to 150 kilograms). We live in a golden age of paleontological discovery—the perfect time to dig in to the spectacular world of dinosaurs. From Aardonyx, a lumbering beast that formed a link between two and four-legged dinosaurs, to Zuniceratops, who boasted a deadly pair of horns, Dinosaurs—The Grand Tour details everything worth knowing about every important dinosaur that scientists know about—more than 300 in all. In Dinosaurs you’ll learn all the gory details—about geology, anatomy, evolution, astronomy, and even Native American and Chinese mythology. Stories of harrowing paleontological expeditions conjure the thrills of history’s most famous dinosaur hunters. Highlights of recent research reveal what’s going on in the world of dinosaurs today, including scientists’ recent discovery of pigments embedded in dinosaur fossils that shed light, for the first time, on dinosaurs’ true coloration. Illustrations on virtually every page bring these prehistoric creatures to life in all their razor-sharp, long-necked, spiny, scaly glory. And for readers inspired to test their dino-expertise in the field, renowned paleontologist Jack Horner’s field notes will help enthusiasts set out on their own expeditions. Track down dinosaur footprints at Horner’s recommended sites, head out on a cross-country dinosaur road trip using Horner’s list of top North American dinosaurs as your map, and learn what it’s like to be a leading paleontologist who’s been part of some of the most sensational dinosaur discoveries ever—and how you can get involved, too! Even though they haven’t walked the Earth for millions of years, dinosaurs continue to amaze little learners. It could be because of how they look or the stories that went with them. Whatever the reason is, one thing is for sure. Dinosaurs are loved and should be used as motivators for study. That is why we used them as theme for this activity book! New evidence that, contrary to what you saw on Jurassic Park, T. rex couldn’t run! The important discoveries and gory details touch on topics from geology, anatomy, evolution, and astronomy to Native American and Chinese myth. Illustrations on virtually every page, true to the latest findings, bring these prehistoric creatures to life in all their razor-sharp, long-necked, furry, feathered glory.